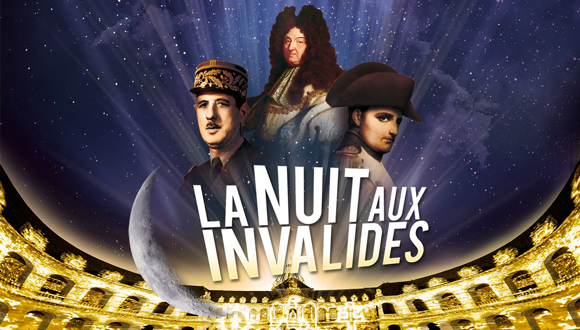 From June 14 to August 27, 2016, the musée de l’Armée and the Hôtel national des Invalides will be hosting the Nuit aux Invalides, 2016 Edition, a spectacular show presented by Amaclio. From the banks of the Seine to the shimmering “frou-frou” of the Belle Epoque, from King Louis XIV state funeral gun salute to the thunder of the Great War, all throughout the summer this new show set in the magnificent courtyard of the Hotel des Invalides will transport you through an enchanting dream-like journey of 2000 years of French history and in particular the history of Paris. Narrated by four noted French actors (Céline Duhamel, André Dussolier, Jean Piat and Jacques Roehrich) the greatest moments in France’s long history will unfold beneath your eyes in a perfect 3D synchronisation. This breathtaking and monumental sound and light show will be projected along the 250 meters long facade of the main courtyard of the Hotel.